Milltown Murals are wall paintings that have a two-dimensional effect with the installation of life-szie figures of local citizens from the 1925 era. This is when Milltown's name was changed to Lakeland. In 2006, Georgia Governor Sonny Perdue visited the city where he issued a proclamation naming Lakeland "Georgia Historical Mural City." Tour information is available at the Chamber's Office in "The Welcome Center." Our newest mural (#33) is William Hughes and his wife Elizabeth sitting on a bench behind R. L. Patten & Son store. Fondly known in the community as "Uncle Billy," he was a successful famer and loyal member of Old Union Primitive Baptist Church. 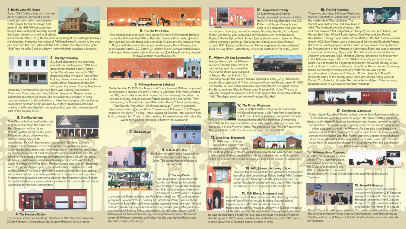 The murals of Lakeland were painted by Ralph Waldrop and Billy Love of Columbia, South Carolina . The first mural was commissioned in 1998 by Nell Patten Roquemore.